These Reiko durable thick nylon pouches are great for contractors, police officers, firefighters, industrial, or anyone who works outdoors as well as rides a bike. It will keep your phone safe and protected, with a metal clip and belt loop for extra security. A very rugged case that does the job yet remains classy and at a GREAT PRICE. Includes a Zoomazig 2 in 1 universal soft touch stylus pen / writing pen that works on touch smart phones, tablets, and other touch screen devices. Rugged heavy duty nylon pouch designed to weather tougher conditions. 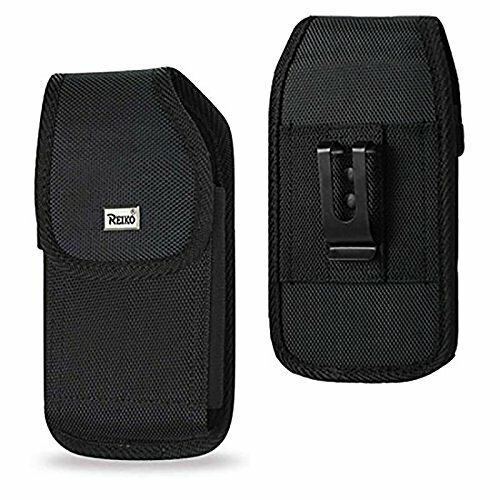 Case includes a metal belt clip and belt loop under the clip for extra security and portability. Secure closure with padded internal cushioning. Convenient stylus pen holder on the outside of the case. Fits the Samsung Galaxy S7 / S6 / S6 Edge / J3 (Universal for all Carriers). Fits best with a single layer protector or thin hybrid. Does not fit the Otterbox Defender. Internal Dimensions: 5.9" x 3.0" x .8". If you have any questions about this product by Zoomazig, contact us by completing and submitting the form below. If you are looking for a specif part number, please include it with your message.